← Driving In Traffic- Dangerous but I Love it! As is often the case, my thoughts began to wonder as I walked to the train the other day sparked by someone’s post about “Sunday Funday”. All I could think about was how much I like “Sunday Fundays” and how I couldn’t wait until my next one. But as I thought more about it, I realized I haven’t had a “Sunday Funday” in years(maybe 5) and the one’s I’ve been a part of in the past decade I’ve left early to go do something else. This was really disturbing. If I really love something, how had I left years go by without partaking. Sure I’ve been busy over the last few years and I work almost every Sunday but those all felt like lame excuses and they are. As I became depressed about my anti-social Sunday behavior, it hit me that I’m not anti-social, have friends and like to spend time with people. 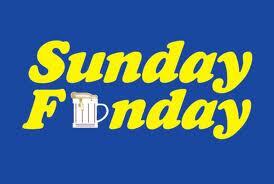 The problem is that I like the “Idea of Sunday Funday” way more than the actual thing itself. Triathlon- Hate the idea of swimming, biking, running for 8-12 hours straight, Like to actually do that. Fame- Like the Idea of it but really uncomfortable if a room full of strangers knows who I am. Bike commuting Hate the idea of it, but find myself enjoying it every time. Fish- Love the idea of fish, but don’t actually like fish. Please run through this exercise yourself because it’ll amaze you. Think of all those things that you “love to do” and the last time you actually did them, it paints a pretty clear picture. Actions speak louder than words in this game. This entry was posted in Bike commute, Car Free, carfreebrad.com, Uncategorized, Urban Bike and tagged event, Sunday, Sunday Funday, United States. Bookmark the permalink.